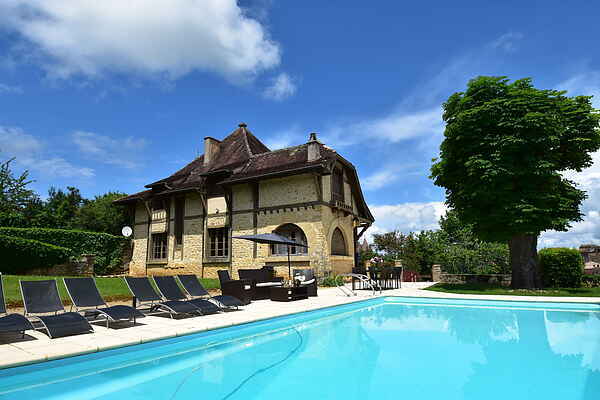 This impressive country house, situated just a few hundred meters from Belvès, is uniquely situated. From the pool you have a wonderful view over the rolling countryside and the medieval town itself. In the morning you can walk into town for some delicious sandwiches, that you can eat in the fenced yard. The wooden fireplace, beautiful windows, wooden floors and high ceilings create an authentic Périgord atmosphere. Belvès is within walking distance. Through a nice shopping street you reach 'La Place '. Here is the medieval market hall, where the weekly market is held. Here you can marvel at the monumental facades and the beautiful clock tower, which you already have seen from your pool. At the end of the afternoon you can settle at one of the many terraces. At Siorac-en-Périgord (7 km) you can rent canoes to make a nice trip on the Dordogne river, along the lovely town of Saint-Cyprien (15 km). A bit further away you will find Sarlat-la-Canéda, the \"pearl of the Périgord\" (35 km). It's a lovely town to stroll through. You can find prehistoric remains in and around Les Eyzies-de-Tayac-Sureuil (24 km).